The Ultimate Fighting Championship is back to England with UFC Fight Night 147 held at The O2 Arena in London on March 17 (AEDT). MMA event billed as UFC on ESPN+ 5 features the six-fight main card following the preliminary card comprising seven matchups. The official weigh-in ceremony was conducted a day before the fight show. 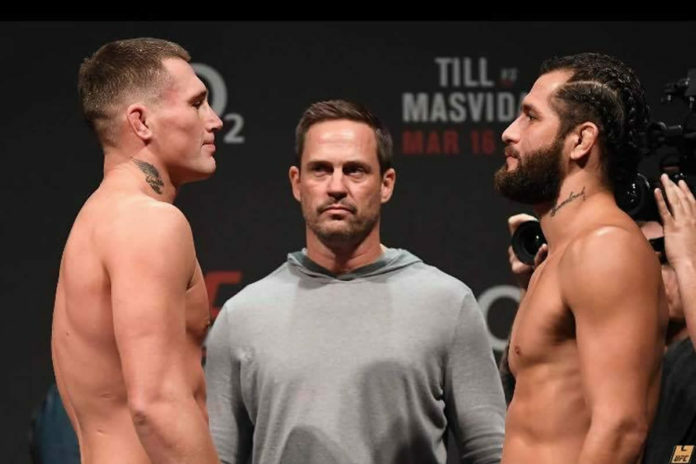 In the main event Darren Till takes on Jorge Masvidal. The pair squares off in the scheduled for five rounds welterweight battle. Both fighters weighed-in at 171. The co-main event is another welterweight matchup between Leon Edwards and Gunnar Nelson. Ewards tipped the scales at 170. Nelson declared 170.7. Also on the main card Volkan Oezdemir weighed-in at 205 for his light heavyweight bout against Dominick Reyes, who was 206. Both, Nathaniel Wood and Jose Quinonez weighed-in 135.5 for their bantamweight outing. Danny Roberts and Claudio Silva showed 170 for the third welterweight bout featured on the main card. Jack Marshman came in heavy, showing 188, for his middleweight encounter with John Phillips who was 185. He “will forfeit 20 percent of his purse to his opponent,” UFC stated. The complete fight card and weigh-in results for UFC London can be found below. *Marshman missed weight and will forfeit 20 percent of his purse to his opponent.